A huge well done to our Year 6 Hockey Team who competed at Aldersley Stadium this evening. Our A and B teams along with The Royal School made up a triangular Tournament with each teams playing 4 games. Team A lost their first game, followed by 2 draws with Ellie scoring a cracking goal against the Royal, showing great awareness to put the ball way. Team B had a slower start losing their first with Cam getting a consolation goal before drawing 0-0 and then a win against The Royal School with Thomas scoring twice. The final game saw a cracking end to end game with Castlecroft A fighting it out against Castlecroft B. An incredibly competitive game saw Eve and Ellie score for Team A but Team B just edged it with Cam getting a hat-trick. How Will kept going after playing in the football tournament this morning i’ll never know! 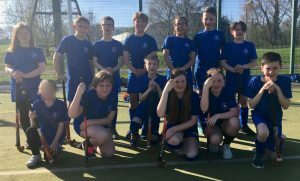 A deserving finish to the Year 6 Hockey Tournament. The standard of hockey tonight was amazing with games played with enthusiasm and determination, skill levels rising as they got used to the space. It is a big jump to move from playing in halls or playgrounds to playing on a huge hockey pitch and I was incredibly proud of them all. Well done. Mr Morgan.